AUSTIN — You want to engage a movie’s story. You want to feel for its characters and, at the end of it all, say it was a rewarding journey. But when a movie hits so close to home and is so devastating, how can someone muster up the courage to leave behind his or her own sufferings to endure another’s? Isn’t the idea to escape our lives when watching a movie? 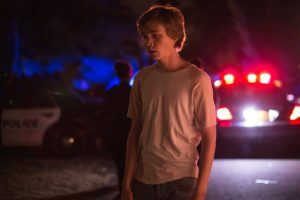 In the case of Andrew Haigh’s gut-punch of a drama, LEAN ON PETE, cinema also can be a place to learn and heal one’s self. Don’t let the film’s trailer, about a boy (Charlie Plummer) and the horse he comes to care for, fool you. LEAN ON PETE is by no means an easy watch. Under the surface of a story that seemingly reflects THE BLACK STALLION is an INTO THE WILD type of journey about facing hardships and overcoming them. It may not be the sort of adventure that you will often revisit, but it’s one that you will actively relive in your mind for many years to come. 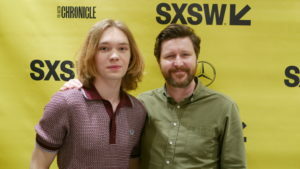 Charlie Plummer, left, and writer-director Andrew Haigh at the South by Southwest premiere of their new film, ‘LEAN ON PETE.’ Photo by Preston Barta. Haigh (director of the Oscar-nominated 45 YEARS) said he came to understand that he has to forget about what an audience member is thinking about. If he were to worry too much about keeping everyone, he believes he would lose everyone. Many of those feelings come from observations. Nothing in LEAN ON PETE is spelled out. So much depends on what you bring to the screen and how you react to certain situations. There are many wide shots and long takes, giving viewers the ability to digest everything in real time. Audiences can look from one side of the screen to the other and pick something out that the camera doesn’t necessarily draw attention to. “I like to provide space for the actors and audience. The way we look at the world, it takes time for details to emerge. I didn’t do close-ups of things we are supposed to look at. I want audiences to watch a scene, have them drift away from characters and notice something. We don’t want to give anything away or be too obvious. It’s a fine balance,” Haigh said. Charlie Plummer plays a 15-year-old boy who escapes his life with the company of a horse. Courtesy of A24. LEAN ON PETE is based on the 2010 book by Willy Vlautin. Its novelized version is told completely from Charley’s point of view. The film version, on the other hand, follows Charley, but it observes him and the space he’s in. Charley’s story had a profound impact on Plummer. Plummer said after the film screened for audiences at SXSW’s opening night slot, he found himself getting emotional during the end credits as James Edward Barker’s musical score came up. “It was hard, because it took me back to that place. By the end of my experience of doing the film, I had lived with that character for so long that it made a huge dent in me. I’m not sure if I will be able to watch it again anytime soon,” Plummer admitted. As crushing as the film is, it’s a rewarding journey, especially during one key scene during its finale. LEAN ON PETE is now playing in select theaters. In the Dallas area, it’s showing at the Angelika Film Center in Plano and the Magnolia Theatre in Dallas.